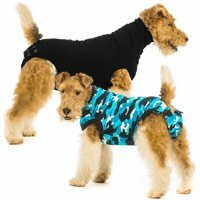 These quality microfibre towelling dog drying coats will dry your dog quickly and easily after a bath, swim or wet winter walk. 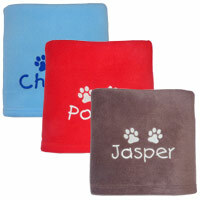 Just pop it on your wet dog and they will dry with no mess, fuss or rubbing on your soft furnishings. Much better for drying your dog than a bath towel. 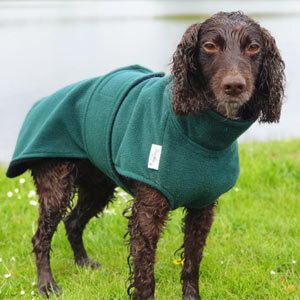 They stay on your dog with the towelling close to their wet coat, so moisture is quickly absorbed and the drying process is much more efficient. And wherever they go, the drying coat goes with them. Perfect. Some cheaper drying coats use standard towelling. Not these. 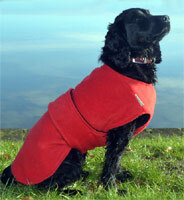 All these drying coats are made from high quality black microfibre towelling that is far superior. It is faster drying and has much greater absorption properties than cotton towelling so your dog dries in extra quick time. The microfibre towelling absorbs water from your wet dog. As the dog dries, their body heat then also dries the towelling, so more often than not when you remove the coat from the dog both the dog and coat are dry! Your dog can wear it in the house, in the back of the car etc... They not only dry your dog efficiently but they keep them warm as they dry off. There are three different styles of drying coat to suit you and your dog's needs and budget - Original, Underbelly and this one - Ultimate. 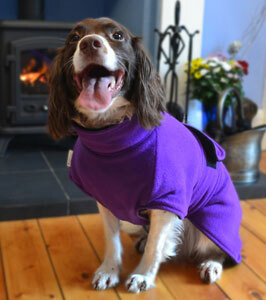 The Ultimate has a cosy polo neck and underbelly strap which wraps around your dog's waist. It is also shaped around the rear of your dog for the ultimate coverage. The rear has a snap fastening so it can be undone if required. Please note that, due to the style, the Ultimate has to go over your dog's head. 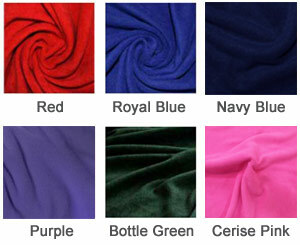 Each drying coat has a polar fleece outer in a great range of colours and patterns. 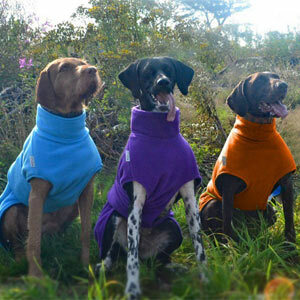 Available in standard sizes or, if a standard size isn't going to be quite right for your dog's measurements, you can select a bespoke option to get the perfect fit. 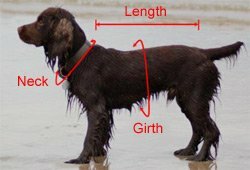 Please measure your dog to get the correct fit. The measuring guide below will help you take the correct measurements. Use a soft tape measure and measure your dog when they are standing up. 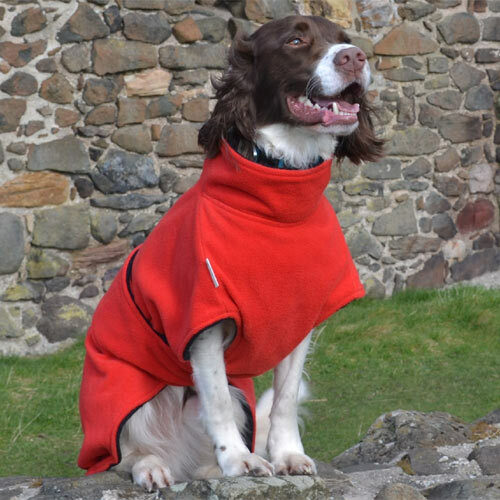 If none of the standard sizes are quite right for your dog, you can choose the bespoke option from the size drop-down box and enter your dog's measurements so a drying coat can be made especially for them. Machine washable at 40 degrees (fasten the Velcro first so it doesn’t stick to the coat or other items of clothing). Do not use fabric conditioners or softeners as this can affect the absorbency properties. Tumble drying is not recommended and do not iron. There are 3 designs to choose from. You are currently viewing the 'Ultimate' drying coat. 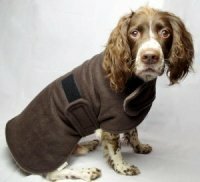 Original This design is the simplest - just like a standard coat shape which lies over the dog's back and fastens at the dog's front and middle. Underbelly The Underbelly version goes over the dog's head. There is a front section that goes between the front legs, covering the chest and first half of the dog's torso, to the middle of the body where it fastens. Ultimate Providing the most coverage, the Ultimate is the same style as the Underbelly (goes on over the head and covers the chest to the middle of the torso) but with the addition of a cosy polo neck and a fastening at the rear to fully enclose your dog in the drying coat. Returns or exchanges cannot be accepted for drying coats that have been used. If necessary please try the coat on dry when it arrives. Returns or exchanges cannot be accepted at all for bespoke drying coats (where you have supplied measurements and the coat has been made to fit your dog). Please measure carefully and state the measurements in centimetres (cm). What a wonderful idea! 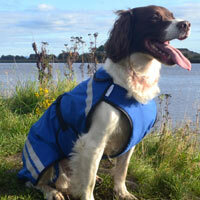 This coat works brilliantly after bathtime and also after beach walks and swimming in the sea. 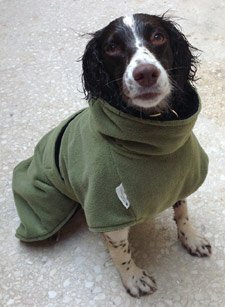 I looked a VERY long time online to decide where to buy a drying coat from. There are lots on the market but on close inspection none I came across were of the quality of this one. This coat is made of very good material and dries the dog's coat without leaving the material soggy and heavy like some others that I know different friends have. I only found this out after talking about my wonderful new dog coat and if I'd known this earlier it would have saved time but they had wished they hadn't bought them! Let's be honest these costs are not cheap but it's pointless buying cheaper if it doesn't work. I talked alot with a lovely lady on the phone about sizing as my labrador is only 11 months and is a big girl but after measuring her well and talking about the different sizes I decided which to order. It is a perfect fit and she was so much help in deciding which size to by and the quality of it is amazing. IT WORKS BRILLIANTLY. I don't know how but don't hesitate to buy this coat. Somehow you're not left with a soggy coat but you are left with a happy dry dog, dry bathroom, kitchen everything on the way to the outside and my car is so much cleaner too!!! It washes well too and we've used it so many times already and my dog is very happy to wear it as it covers all of her securely I think she forgets she has it on. I don't usually leave reviews for things for me but this is so good I had to. After years of not bothering with a Lab Coat and just drying with towels we decided to treat the latest lad to one of these for his holiday in Cornwall to help keep the cottage dry. It does it's job and we chose it in preference to others because it has the microfibre liner which absorbs water quickly but does not remain soggy as do cotton towelling ones. The delivery was quick for which we are grateful. One thing that I would recommend is to go the custom route as it doesn't cost any more and you should get a better fit; ours is OK but as our lab is the show strain his head is larger than a working strain and it means that you need to pull it off with a bit more umph than one that is a custom fit. Excellent quality & materials. 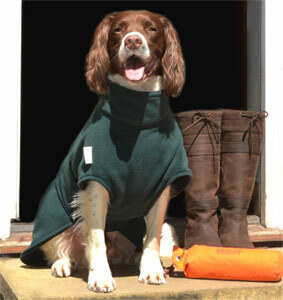 Keeps my Spaniel warm while he’s drying off after a muddy walk or a bath. Used almost every day since purchased. Absolutely fantastic for stopping the dogs shaking mud everywhere in the car after a walk. Got 2. The drying coat not only effectively dries my dog but it also protects my furniture and rugs from all the (now history) mucky muck. Absolutely thrilled with the bespoke drying coat we ordered for our Jack Russell dog. It is very well made and excellent quality. I'm sure it will keep her warm after our wet winter walks. How to keep a spaniel happy! 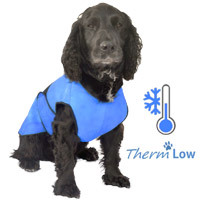 Awesome quality coat - has meant my perpetually wet spaniel can now dry off totally.before coming in the house and jumping on everybody and everything! Happy spaniel and happy humans! I was a little skeptical when I read the description, which said dries within the hour. I bought the coat anyway and guess what? It does exactly what is says on the tin! No wet dog smell penetrating the house when she comes in from a rainy walk. We put on her drying coat and she is dry within the hour. Not sure how it works but it does! I am really pleased with my purchase.